"...the idea occurred to me... how charming it would be if it were possible to cause these natural images to imprint themselves durably, and remained fixed upon the paper!" Interestingly, he also used a camera obscura, with waxed paper to trace the utlines of an image upon; this works very differently from the camera lucida, which does not project the image, and the former device leads more directly to the invention of photography. Concurrently, in France, Niépce had made his own experiments, but conceived of photography primarily as a medium to reproduce existing works of art; Daguerre, who took up Niépce's work, had previously invented the diorama, a spectacular form of entertainment, noted for its changing lighting effects, that competed with the panorama - and, like the panorama, was capable of bringing distant lands to a sophisticated urban audience. Despite all the technological difficulties of a truly mobile photography, from the beginnings of the wet plate photograph, the camera travelled - alongside a mobile darkroom. Glass plates had to be coated with a light-sensitive emulsion, and then exposed in the camera while this emulsion was still wet and subsequently developed. Photographic expeditions in the 19th century were very much in the mould of imperial explorations, with mule trains, handlers, camp equipment and such like, up to the point of the formulation of the dry plate. These could be bought from specialist manufacturers in bulk, exposed in the camera, then developed at leisure when the photographer returned. Shortly afterwards, towards the close of the 19th century, the Kodak camera was produced, and, together with flexible roll film, defined photography for much of the century to come. A symbol of the affinity between travel and photography was the fact that many cameras were named with such associations: the Reisekamera - literally "travel-camera" - was an early, more mobile version of a studio plate camera. This idea became more prevalent as photography became increasingly available to the widest sections of society. There are at least five different cameras that use the word tourist in their names; four different traveler cameras (and one traveller); a couple of explorers; the Russian Sputnik camera may have been named for the satellite, but 'sputnik' can be literally translated as "travelling companion"; and a great number of 'scout', usually box, cameras, with all the implications of camping and the outdoors. The first time I used a camera, that I was given a camera to use - I presume I must have shown an interest in doing so - was in 1983, on holiday, camping in France. These very first photographs were taken with a Kodak Instamatic 50, making square photographs using the old 126 cartridge format (my mother had just been given a new 35mm SLR camera, and indeed, I'd forgotten about these early photographs for many years). 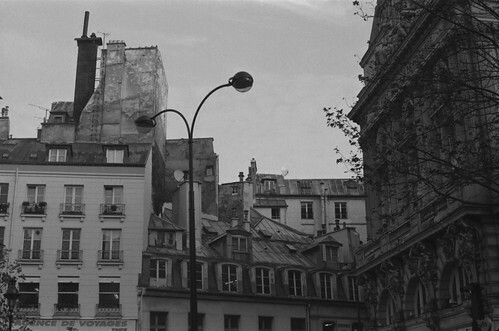 In Paris in 1994, with my then nearly new (to me) secondhand Praktica SLR, I shot five rolls of film, all black and white, the first negatives that I developed in the darkroom at my college on my degree. Looking back at the contact sheets, the images are (mostly) of subjects I would not now take photographs of - both the subjects, or their framings, specifically. There are lots of photographs of statuary, perhaps not surprising for my first experience of Paris. Notably, I went to the Louvre and didn't go to see any paintings at all, just sculpture. The sculpture stood in for missing human subjects, and the images ended up being used in photo-collages and etchings, including a series of photo-collages made at home over the Christmas break. I was also interested in the medium of the artist book at the time, which I made from original photographs, photocopies, and ephemeral material collected from the journey. However, these became exercises in empty aestheticism: I was looking to create complicated imagery that suggested meaning, without containing it. It was a lack of confidence that I could not let the photographs exist on their own merits. "...it is hard to be a snob and a tourist at the same time. A way to combine both roles is to become an anti-tourist. Despite the suffering he undergoes, the anti-tourist is not to be confused with the traveler [Fussell makes distinctions between explorers, travellers, and tourists]: his motive is not inquiry but self protection and vanity. [...] A useful trick is ostentatiously not carrying a camera. If asked about this deficiency by a camera-carrying tourist, one scores points by saying, "I never carry a camera. If I photograph things I don't really see them." It is too simplistic to reduce experiences of looking in combination with photographing to the binary oppositions of the anti-tourist. 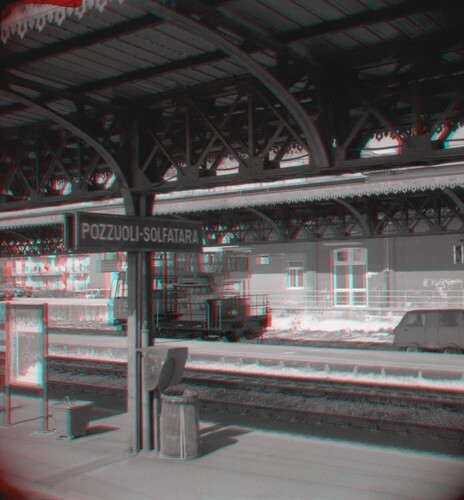 For a time, perversely, I took a number of trips accompanied only by an old 35mm stereo camera. The severe limitations of using this format made sense for a time, but the camera wasn't very reliable. On more recent journeys I've taken a 35mm camera, a folding medium format camera, and some form of subminiature camera too. 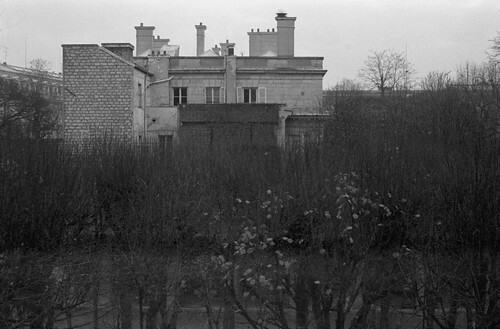 Using film does mean not being able to see one's results immediately, usually not until after returning home. The photograph's function as an aide memoire is reinforced in the process of developing and revisiting images which may have been present in the viewfinder for a fraction of a second. Polaroids of course share a near-instantaneous aspect with digital photography: in Wim Wenders Alice In The Cities, Philip uses a Polaroid camera to photograph the surfaces of America, specifically the innovative SX-70, then relatively new, using integral film (not peel-apart negatives and positives which previous instant cameras used); Dennis Hopper in The American Friend photographs himself with a Polaroid. Leaving the development of film until later always provides an anxiety, however small, that something may go wrong with the film. Thus the undeveloped film is a precious cargo, a repository of memories and locations. On my journey through Brussels, Cologne, Wuppertal, Gelsenkirchen, Hamburg, Copenhagen and Stockholm, I've shot a number of rolls of film in all three formats. Their contents will reveal themselves in the course of time.